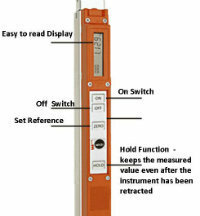 The Nedo mEsstronic Easy Measuring Pole is an easy-to-use electronic measuring tool for the skilled tradesman. Simply place the mEsstronic Easy in position, pull out the extending sections and read off the measurement from the digital display. The zero function allows to set reference points for relative measurements. Deviations from the reference points are calculated automatically. The hold button permits the measured value to be retained in the display. In this way, a measurement can be taken in an inaccessible place and then be read off at a more convenient time. Hold function: permits use in almost inaccessible places and read-off when convenient. 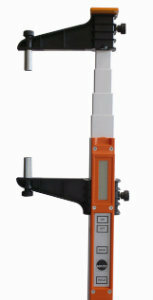 Nedo Messtronic Easy Telescopic Measuring Pole with 2 measuring Jaws. (Telescopic tracking and Tram Vernier). Clip-on measuring jaws for easy and convenient measurements of external dimensions.